A caring choice for equine joint pain. 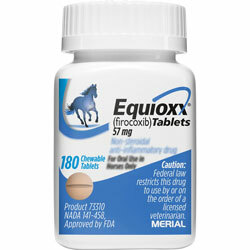 Equioxx (Firocoxib) is a Non-steroidal, anti-inflammatory drug for the control of pain and inflammation associated with osteoarthritis in horses. Each Equioxx Tablet contains 57 mg firocoxib. Equioxx Firocoxib Tablets are recommended for oral administration in horses weighing 800 - 1300 lbs., once daily for up to 14 days. Firocoxib. Proven to relieve the pain and inflammation of equine OA. Prove in both field and laboratory trials to be safe at the recommended dose. Easily administered, once-a-day tablet that is well-accepted by 98% of horses. 24 hours of targeted pain relief. Always provide the Client Information Sheet with the prescription. The recommended dosage of EQUIOXX (firocoxib) is one 57 mg tablet, for oral administration in horses weighing 800 – 1300 lbs, once daily for up to 14 days.